With a rather late start to the day planned, we awoke slowly and worked our way down to breakfast at the hotel. They offer a variety of fruit, cereal and juices, in addition to fresh, made-to-order meals. Ben had loads of the common "breakfast blend" juice, wishing this was available in the States, some fruit, a cheese omelet (communication malfunction) and some toast. It was very delicious. Kari just had some fruit, yogurt and granola/cereal. Following breakfast, we continued to get ready for our private tour. Ben's stubbornness continued to grow, seeking to not be denied his shark cage diving experience. Before we were ready to head out on our tour, Ben expressed his desire to get onto a shark cage dive, saying that we were willing to do whatever and whenever. We only need to know when to wake up. As luck would have it, before we left on our tour, they found a company willing to take us in the morning. 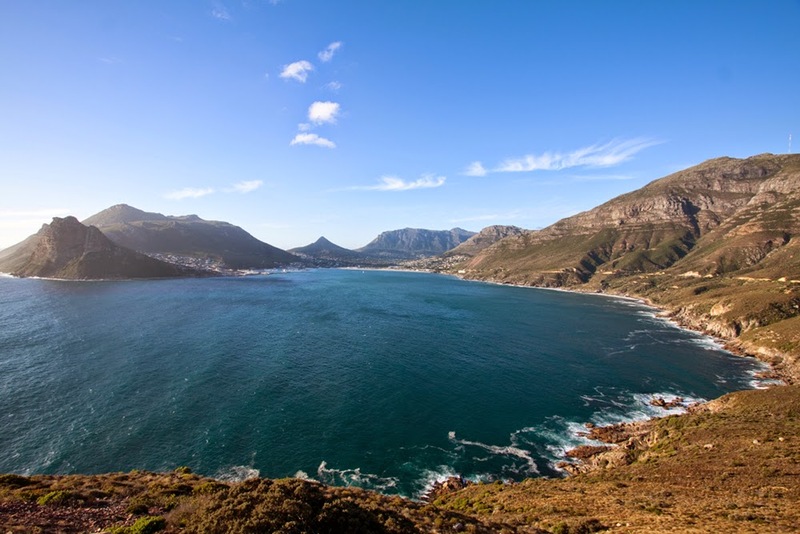 Feeling cautiously optimistic, we set out with our guide to begin our journey around Cape Peninsula. 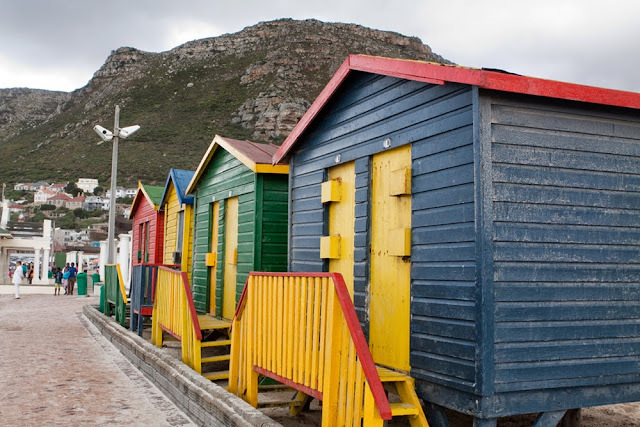 The first stop was in Muizenberg. As we discovered, Muizenberg is a surfer's mecca. 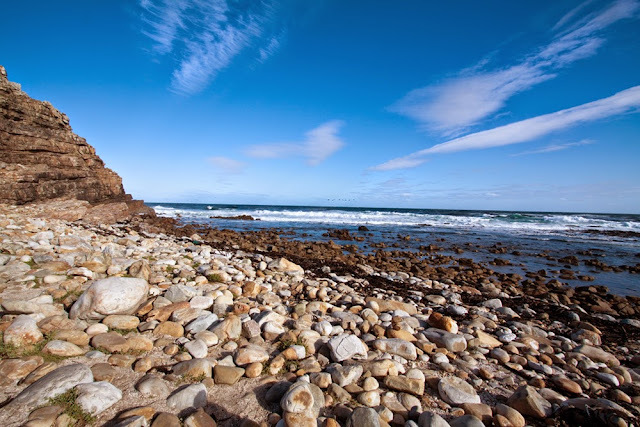 Situated on False Bay on the Indian Ocean side of Cape Point, the surf and warmer water temperature created relatively ideal conditions for those just learning how to surf. During our time there, there must have been hundreds of surfers throughout the beach and first 50 meters in the water. Our guide, Netemba, said we should feel the Indian Ocean, so we took our sandals off and walked down into the water. While it was warmer than the Atlantic, it was not much warmer. 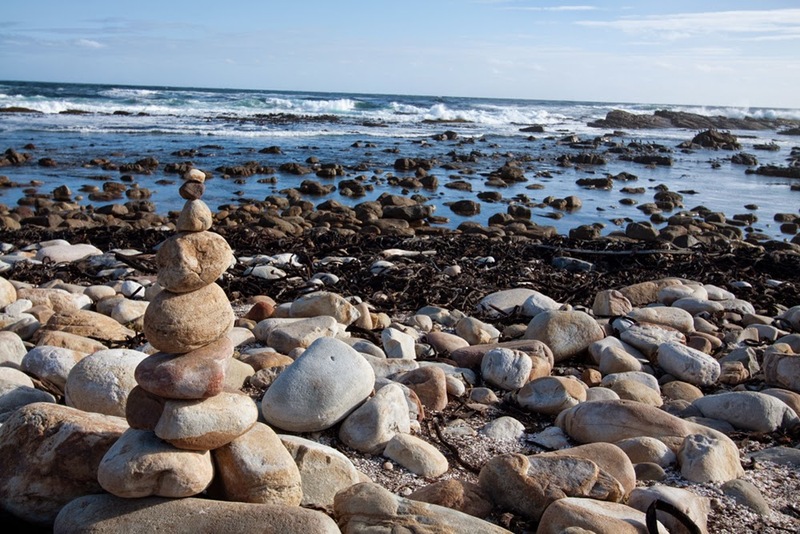 Following Muizenberg, we set off along the peninsula to Kalk Bay. We stopped at the harbor to walk out onto the pier. Right as we stepped onto the pier, some Cape fur seals were playing below us. We stopped to watch before continuing on to see the fishermen on the rest of the pier. Unlike most dock fishing that Ben is aware of, these fishermen were using poles designed for deep sea fishing. There were even slots in the pier for the fishermen to put the poles in while waiting for a fish. Ben asked one of the fishermen what he was hoping to catch. He said that it changes based on the weather and they never really know what why may catch. 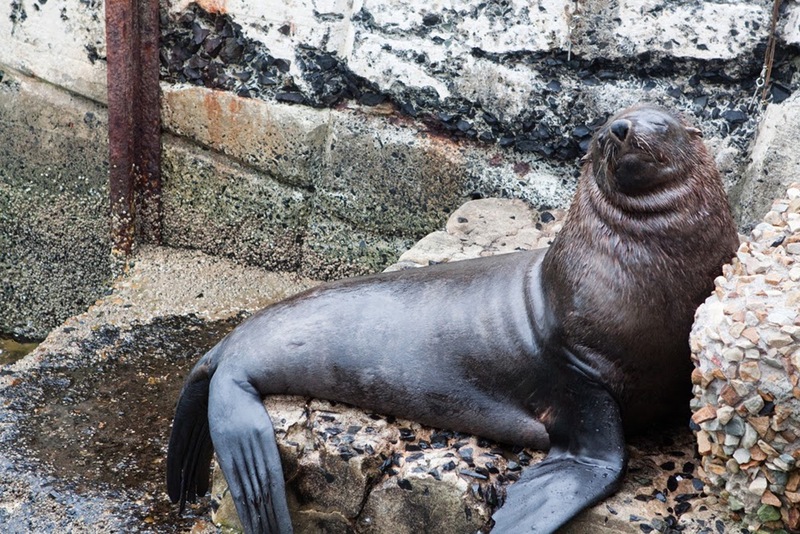 Once we took a few pictures of Kalk Bay, we proceeded back to our seal friends, watching the little ones fight for a dominant perch below the big, dominant seal. Essentially fighting to be #2. At this point in our journey, Kari was already super excited about the rest of our day. Our first two stops had been great. Now off to Simonstown and the Boulders Beach Penguin Colony. When you think of animals found in Africa, what comes to mind? Camels, giraffes, lions, elephants, cheetahs, rhinos, hippos, etc. Penguins? Not so much. Sure enough. 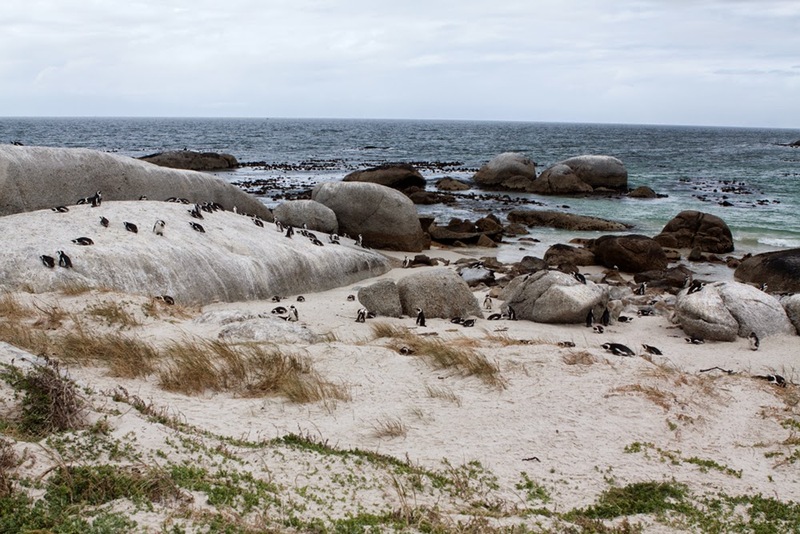 There is a fairly large penguin colony of African Penguins on the coast of False Bay in Simonstown. 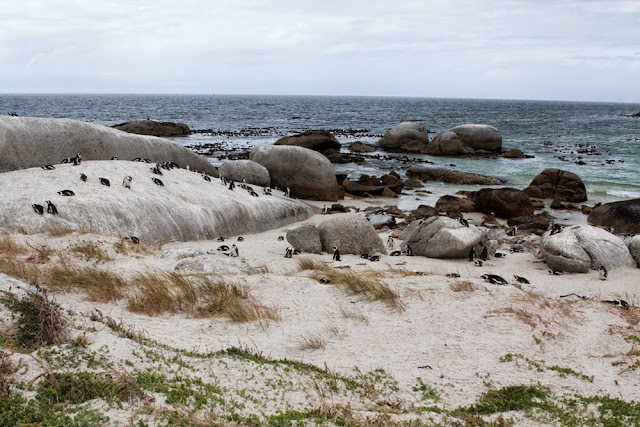 Before entering the penguin colony, we walked along the boardwalk towards Boulders Beach, encountering several penguins and dassies along the way. What is a dassie? That is a great question! 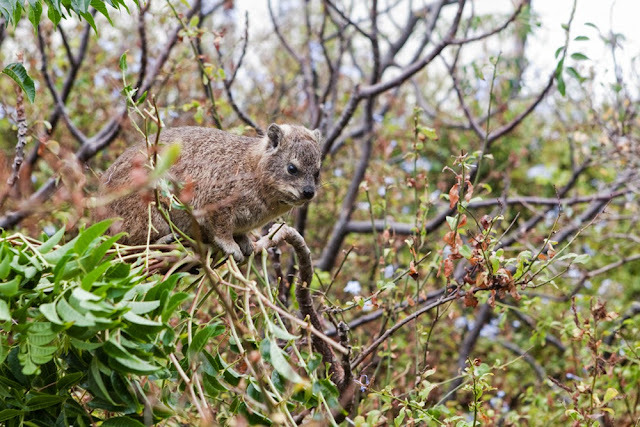 Dassie is the Afrikaans word for rock hyrax or rock rabbit. This strange little creature's closest living relative is the elephant. When you look at this furry, brown creature about the size of a small dog or cat, the last thing that comes to mind is elephant, but so it is! After our journey along the boardwalk, we ventured into the penguin colony. We commenced our typical zoo/museum protocol: read every sign throughout. As we got closer to the water, the air temperature, thanks to the wind, continued to plummet. Along our way, we discovered that the penguins had man-made burrows designed to simulate a nest, in addition to lots of plants and trees to provide the necessary resources to build their nests. Like all of the other tourists, we snapped many photos of the penguins relaxing on the beach, trying to identify the young ones from juveniles from adults. On our way back out, we stumbled across a penguin warming an egg. Super cute! Before getting back on the road, we grabbed some drinks from Cafe Penguino. In America, we have deer crossing signs; however, in Cape Town, they have watch out for penguin signs. They sure mean business. No sooner had we exited the parking lot had we stumbled across a penguin in the road. 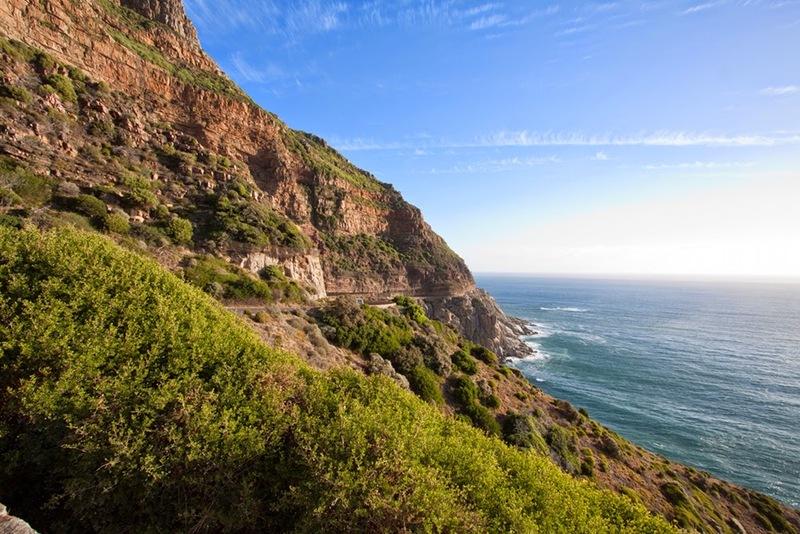 The drive from Simonstown to Cape Point was absolutely beautiful. It hugged the coast line part way up the mountainside, providing stunning vistas to the mountains across the bay. One strange sign we encountered along the drive was "Baboons are dangerous and attracted to food". We both ask our driver about the baboons, completely surprised for the potential to see baboons on this leg of our journey. 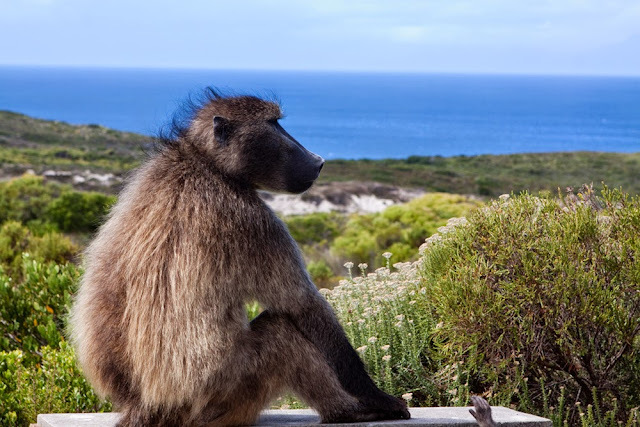 Sure enough, within a few minutes after entering the Cape of Good Hope Nature Reserve, we came across our first of several baboon traffic jams. While we are fairly used to buffalo traffic jams, this was our first baboon traffic jam. Unlike buffaloes that generally just use roads as convenient and easy methods of travel, baboons spread out and bask in the sun on them. A few stay off to the sides to watch and others will walk towards the cars; however, a good number were just laying on the road getting a tan. One baboon made it onto the roof of a car in front of us, trying to get closer to the humans and their tasty treats inside. It rode along on the roof for a while before jumping off and continuing its day. Before long, we arrived at the parking lot for the ascent to Cape Point. We jumped out and stared in awe of the site. 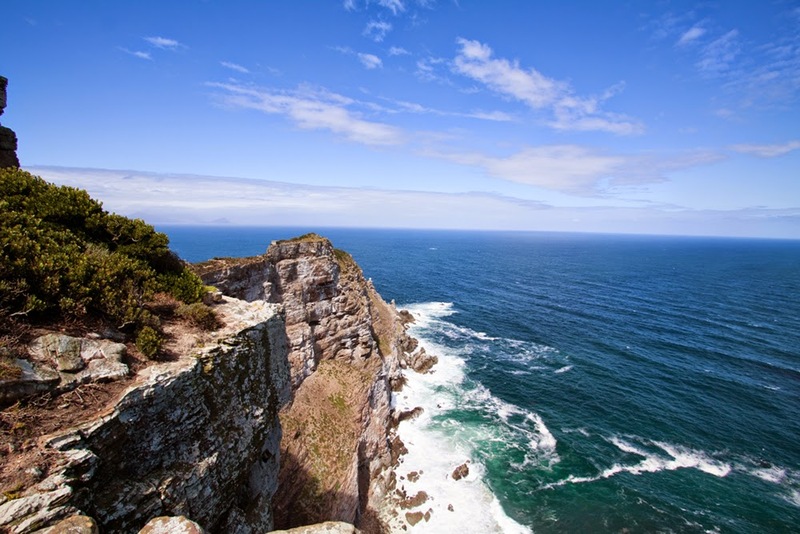 Only a few hundred meters from us was the tip of Cape Point and the confluence of the Atlantic and Indian Oceans. 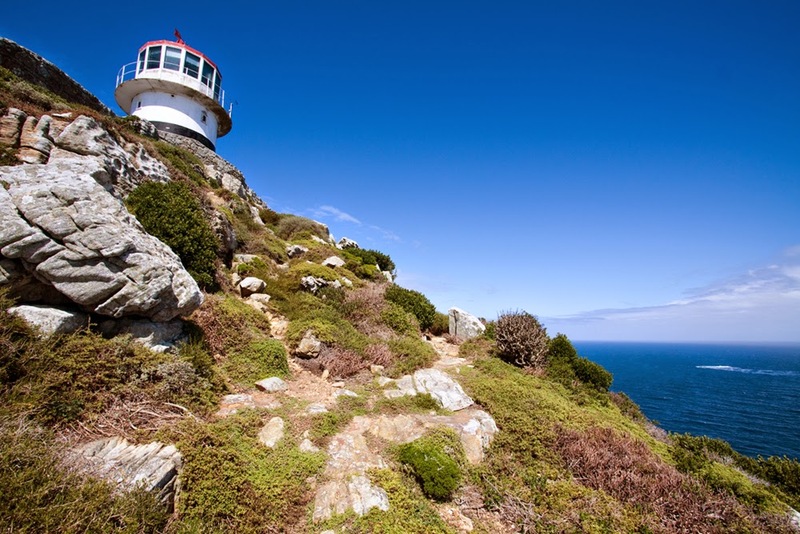 We admired the coastlines before we began our assault on the climb leading up to the lighthouse and the point itself. Of course along the way, we stopped to take the typical tourist photo next to the sign. Who doesn't? After sitting in the car all morning, it felt nice to get out and stretch the legs a bit. We often wondered if our guide was going to make it. He often looked winded and struggling to keep up. Granted, he did have the challenge of trying to keep up with us and we certainly enjoy pushing ourselves. Once we reached the lighthouse, we took some photos and noticed the sign indicating distances to major cities around the world. Ben asked if it was possible to see Antarctica, to which our guide responded that it would have to be a really clear day. We saw a path to get to the tip of Cape Point and the currently functioning lighthouse and naturally set off. We scampered on some ruins along the way, really trying to soak in the moment. 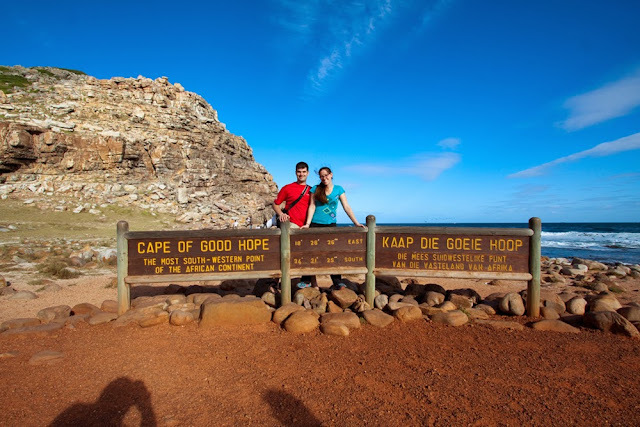 When we reached the end, we stood in awe for a few minutes before heading back out to find the Cape of Good Hope. On the drive down to the Cape of Good Hope, we spotted some ostriches, yet another interesting critter on our journey for the day. The sign at the Cape of Good Hope seemed much more crowded than Cape Point, so we bypassed the sign to climb to the lookout point instead. 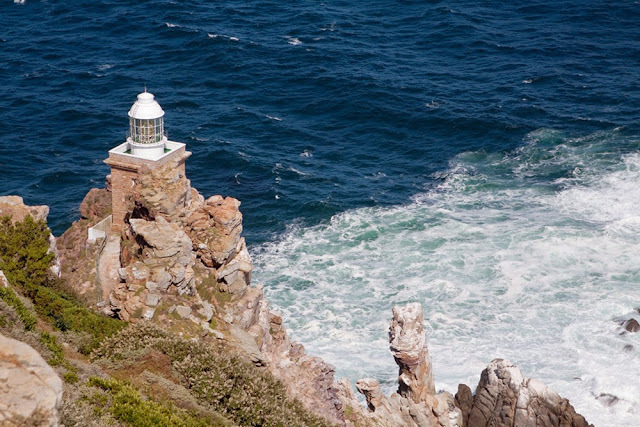 Able to see the Atlantic, along with the functioning lighthouse on Cape Point, it provided a stellar view. The waves crashed hard onto the rocks below, demonstrating the sheer power of the water. 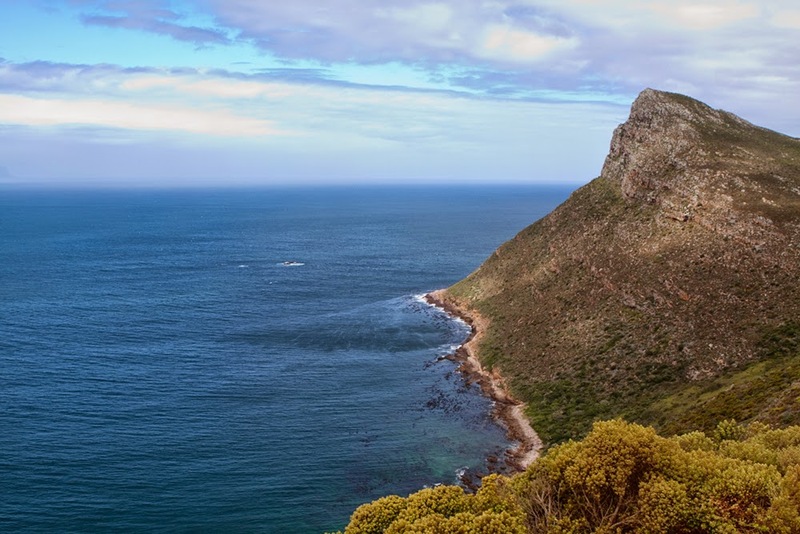 We later learned that the Cape of Good Hope is also known as the Cape of Storms and that there are many shipwrecks off shore. When we climbed down from the lookout, we waited in line to take a picture with the Cape of Good Hope sign. Ben felt really bad for the guy in front of us as he was stuck with the chore of photographing a lot of people, individually and as a group. We walked to the shore to get closer to the waves crashing onto the rocky beach. Very powerful. Noting that it was getting late in the day, we opted to skip the ostrich farm and begin the journey back. It was a good thing we did. As we arrived at the gate to Chapman's Peak Drive, the gate attendant, appearing ready to close the gate, waved us through. Whew! We made it with about 2 minutes to spare. We had been told this is one of the most beautiful roads in the world with some absolutely stunning views. They were right! It ranks as one of the most beautiful drives Ben has ever been on along with the Going-to-the-Sun Road in Glacier National Park. Ben had our driver stop in the middle of the road to take a picture of one of the bridges/tunnels. Kari thought this was a bad idea; however, there was no traffic and Netemba agreed. When we made it to Chapman's Peak, we were signaled by security personnel to keep going as they were closing the road in preparation for the Cape Argus Cycle Tour. In case you are unaware, the Cape Argus Cycle Tour is the largest cycle race in the world with over 35,000 participants. 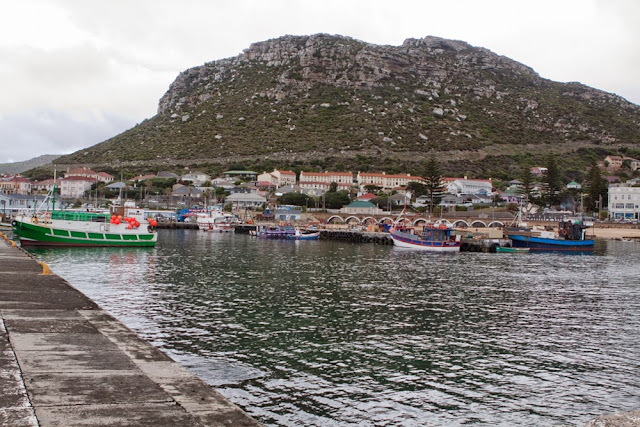 Trying to heed his wishes, we quickly snapped photos of Hout Bay and continued on. It was a little disappointing that we could not capture it all in pictures. After leaving Chapman's Peak Drive, we drove into Hout Bay. We were told there was an amazing working harbor and boats we could catch to go to Seal Island, home to over 60,000 seals sometimes highlighted during Discovery Channel's Shark Week. Unfortunately, we arrived into town too late and all of the harbor and boat rides were closed for the day. Not wanting to end the day on a bust, Ben asked Netemba if we could go to Signal Hill, seeing that there was a little daylight left. Kari had asked what Signal Hill was over the few days previous, so Ben figured we could go find out together. Signal Hill overlooks Cape Town and Camps Bay. With the sun setting rapidly, hordes of people were getting into position to watch the sunset over the Atlantic. 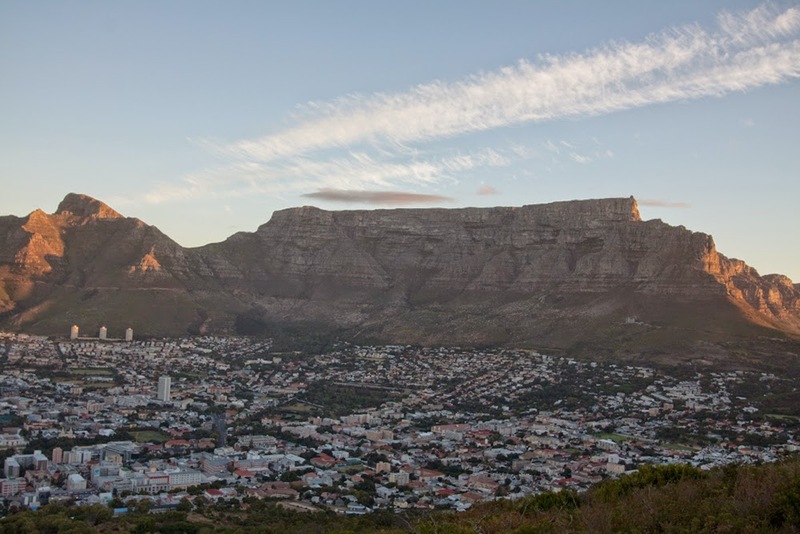 Signal Hill provided exceptional views of Robben Island, Table Mountain and the Mother City below. It also marked the end of a long and exciting day. Back at the hotel, we were informed that our shark dive for the next day was cancelled due to weather. Bummer! We totally struck out with shark cage diving on this trip. Next time we are in South Africa, we will have to do that, perhaps even take the PADI Great White course offered by Shark Diving Unlimited. We were also informed that though we were unable to get into Hussar's, they were able to get us a table at the Codfather. While waiting for our reservation, we went up to the room to change and drop our stuff from the day. The Codfather is an internationally known seafood restaurant. Also, they do not have a menu, only a wine list. Their menu is either at the sushi bar on the rotating carousel or in the glass counter in the seafood portion of the room. If you know anything about Ben, you probably know that he does not like seafood. Strange choice of restaurant for someone with his culinary interests. Cape Town is internationally known for its seafood and Ben wanted Kari to have the ability to try their fresh seafood at its finest. Plus, they did offer two non-seafood options: beef or chicken stir fry. Kari excitedly picked out her meal from the counter: a few different kinds of prawns and some butterfish. Ben chose the chicken stir fry. Boring, we know. Kari absolutely loved her meal, especially one of the prawns, noting that they did not require any of the provided sauces. Ben's stir fry was ok. Kari was happy and that was all that mattered. Following dinner, we tried to get gelato on the beach, but we were unsuccessful as all shops had closed. Back at the hotel, we made another booking at Hussars for the next night, hoping to sample some of the best steak in Cape Town before we left. We wrapped up the evening with a quick Skype call to Kari's Dad before getting some rest.